BEVERLY HILLS, CA - Anchor Bay Entertainment and The Weinstein Company are proud to announce the home entertainment release of Jonathan Teplitzky's The Railway Man , based on the extraordinary memoir of World War II prisoner of war, Eric Lomax. 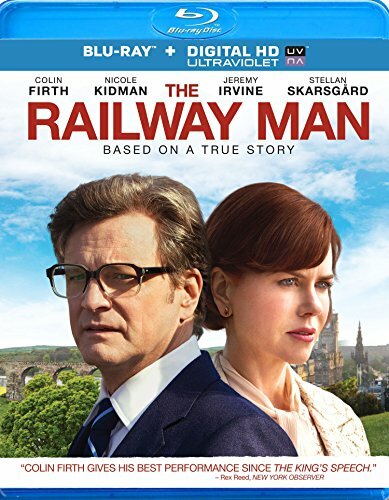 With powerful performances by Colin Firth and Nicole Kidman, The Railway Man will be available for digital download on August 1, 2014 before heading to DVD and Blu-Ray(TM) with Digital HD UltraViolet(TM) on August 12, 2014. The Weinstein Company released The Railway Man theatrically on April 11, 2014 to critical acclaim. Gary Goldstein of the Los Angeles Times raves that the film is "an impressively crafted, skillfully acted, highly absorbing journey into a dark corner of world history." "Colin Firth gives a compelling performance," lauded Stephen Holden of the New York Times, "Nicole Kidman is radiant." Academy Award(R) Winners Colin Firth* and Nicole Kidman** star in the remarkable autobiography of Eric Lomax (Colin Firth), a British Army officer who is captured by the Japanese during WWII and sent to a POW camp, where he is tormented and forced to work on the Thai-Burma Railway. Decades later, still suffering the trauma of his wartime experiences, Lomax and his wife Patti (Nicole Kidman) discover that the Japanese interpreter responsible for much of his treatment is still alive and set out to confront him, in this powerful and inspiring tale of heroism, humanity and the redeeming power of love. The Railway Man is rated R for disturbing prisoner of war violence and has a running time of 108 minutes. Special DVD and Blu-Ray(TM) features include The Making Of The Railway Man and Feature Commentary With Director Jonathan Teplitzky And Co-Writer/Producer Andy Paterson. The Weinstein Company (TWC) is a multimedia production and distribution company launched in October 2005 by Bob and Harvey Weinstein, the brothers who founded Miramax Films in 1979. TWC also encompasses Dimension Films, the genre label founded in 1993 by Bob Weinstein, which has released such popular franchises as SCREAM, SPY KIDS and SCARY MOVIE. Together TWC and Dimension Films have released a broad range of mainstream, genre and specialty films that have been commercial and critical successes. During Harvey and Bob's tenure at Miramax and TWC, they have received 348 Oscar nominations and won 82 Academy Awards. Since 2005, TWC and Dimension Films have released such films as GRINDHOUSE; 1408; I'M NOT THERE; THE GREAT DEBATERS; VICKY CRISTINA BARCELONA; THE READER; THE ROAD; HALLOWEEN; THE PAT TILLMAN STORY; PIRANHA 3D; INGLOURIOUS BASTERDS; A SINGLE MAN; BLUE VALENTINE; THE COMPANY MEN; MIRAL; SCRE4M; SUBMARINE; DIRTY GIRL; APOLLO 18; OUR IDIOT BROTHER; I DON'T KNOW HOW SHE DOES IT; SARAH'S KEY; SPY KIDS: ALL THE TIME IN THE WORLD IN 4D; MY WEEK WITH MARILYN; THE IRON LADY; W.E. ; CORIOLANUS; UNDEFEATED; THE ARTIST; BULLY; THE INTOUCHABLES; LAWLESS; KILLING THEM SOFTLY; THE MASTER; SILVER LININGS PLAYBOOK; DJANGO UNCHAINED; QUARTET; ESCAPE FROM PLANET EARTH; DARK SKIES; THE SAPPHIRES; SCARY MOVIE 5; KON-TIKI; UNFINISHED SONG; FRUITVALE STATION; LEE DANIELS' THE BUTLER; THE GRANDMASTER; SALINGER; 12-12-12; PHILOMENA; MANDELA: LONG WALK TO FREEDOM; AUGUST: OSAGE COUNTY; VAMPIRE ACADEMY; THE RAILWAY MAN and THE IMMIGRANT. Upcoming releases include YVES SAINT LAURENT; BEGIN AGAIN; THE GIVER; FRANK MILLER'S SIN CITY: A DAME TO KILL FOR; UNDERDOGS; TRACKS; THE DISAPPEARANCE OF ELEANOR RIGBY; ST. VINCENT; THE IMITATION GAME; PADDINGTON and BIG EYES. TWC boasts an active television production division led by former Miramax Films Co-President of Production Meryl Poster. TWC garnered nine Emmy nominations in 2013. The Weinstein Company Television produces the reality powerhouse Project Runway, prepping for its 13th season on Lifetime; with its spin-off series and critically-acclaimed Project Runway All Stars, hosted by Alyssa Milano and Project Runway Under The Gunn, hosted by Tim Gunn which is currently on air. TWC series that were produced in 2013 include Mob Wives Season 4 which VH1 has green lit for Season 5, Million Dollar Shoppers for Lifetime, Rodeo Girls for A&E and Trailer Park: Welcome to Myrtle Manor Season 2 for TLC. Scripted project currently in production is John Fusco's historical action-adventure epic Marco Polo. Announced scripted projects in development include Ten Commandments a 10 part event series with each episode to be helmed by a different A-list director and focusing on one commandment and an adaptation of Daniel Stashower's bestselling Civil War-era spy thriller The Hour Of Peril. TWC also developed Amy Sherman Palladino's The Nanny Diaries for ABC and produced the Peabody award-winning HBO series The No. 1 Ladies' Detective Agency, directed by Anthony Minghella.